Limited choices when we stopped in. Picked up some DC Brau, which was nice. Prices seemed similar to other places. If you in the area, go ahead and stop, don't go out of your way. After a beer at Union Jack and on our way back to the car, I stopped at Murphy while the wife browsed a store across the street on the quaint touristy downtown area of Winchester. There's not much going on here atmosphere-wise, just a little store full of beer bottles and some food and basic necessities like water. Most of the brews are room temperature. I spotted Evil Twin (Imperial Doughnut), Fuller's Vintage, Southern Tier, Old Stock, Labyrinth Black Ale, DuClaw, New Belgium... plus imports from Belgium and Germany. I bought a Three Brothers Resolute Bourbon Barrel Imperial Stout that was pricey at twenty dollars but definitely delicious and highly rated. The woman working the store was nice and offered help, but I knew what I wanted. Prices are not the cheapest, but where else are you find quality craft beer around here? Worth a stop, and then some. 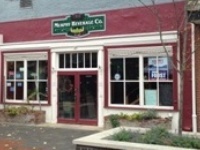 Murphy Beverage Co. is a nice little store on the downtown walking mall in Winchester. Their beer selection is pretty limited. They have a lot from a small number of American breweries (Dogfish Head and Stone mostly) and a few international brews. As with most small stores like this, I do worry a bit about freshness, especially with the international stuff. The employees are usually content to let you browse without interruption and sometimes aren't the biggest help with beer. That, combined with their small selection and high prices, makes this a kind of "last stop" place for me if I'm looking for something specific. Still, it is nice to stop in every once and a while and see what they have in stock. They definitely carry some good beers, as one would expect. Service was unremarkable. I don't think the person knew much about beer. The selection of good beer was much better than the average grocery store, but it wasn't up there with most other wine/beer stores that I've been to. It seemed to me that all their beers are those available in any somewhat beer-focused store in VA (e.g. Duvel, Old Rasputin). One notable exception was the brooklyner-schneider hopfen-weisse, which I haven't found anywhere else in Winchester, Williamsburg, or Northern VA (Arlington/McLean/Falls Church). And while I was very pleased to find it, I think that was the only remarkable find in the store. The value was fine. Most beers had the standard VA prices, but the 1 pint 9.something ounce corked hopfen-weisse was about $14, which seemed steep, but since I haven't seen it anywhere else I can't say for sure. They also carry limited homebrew supplies and a little glassware. Overall, definitely worth going in if you pass by. You shouldn't expect to find anything that you can't find elsewhere, although I found something (the hopfen-weisse). A much wider selection is available at the Country Store, also in Winchester. Note: As a previous review mentions, it is directly across the street from Brewbaker's, which I certainly hope is not "the best pub in town," as they have no beer list at all, and server couldn't tell me what bottled beer they even had, and it turns out Magic Hat #9 and Guinness, which were on tap, is as interesting as they get (everything else was BMC type stuff.) Also the food wasn't very good. This is not a bad shop to go to, unfortunately it's the only beer shop in the area (next location: The VA Touch in Berryville). The guy who is always there tends to be knowledgeable about beer but when I try to talk to him he always seems like he has something better to do than answer my question. The store also sells a very limited amount of home brew equipment, which is a bummer because the next closest home brew shop is quite a trip. Overall, if you're desparate for some different beer and can't make it to Berryville, Murphy Beverage Company will suffice. Oh yeah, and the prices are higher than at The VA Touch. Stopped here while in Winchester en route to the Outer Banks stopped here after leaving Piccadillys this place is just 2 blocks down the road a couple minute walk. It's in like a little outdoor mini mall area. Closed at 9:00 on a Friday night got ther at 8:45. The place was small but nicely organized and neat had homebrew supplies winemaking supplies,some books and a maybe a hundred different beers in the back lots of imports the usual,Fullers Sam Smith, Hobogolin,some Germans and a couple Belgiums. Just a small cooler with some imports and some Rouge and Troegs. I picked up a bottle of Fullers vintage 06 for $6.99. Nothing interesting enough for a mix and match six pack. Don't think this town has any places with a great beer selection this is about it. If your in the area i'd check it out. Nothing to go out of the way for. I stopped in Winchester for dinner and thought Old Town would be worth checking out. It was late in the evening, so only a few restaurants, Daily Grind and Murphy's was open. When I went in, I was immediately drawn to their modest homebrewing supply section which is small but certainly has a lot of the little things a home brewer could do with picking up. They also had a few nice beer kits. An employee noticed me checking out the brewing supply and struck up and interesting conversation about how Pennsylvania has a lousy number of homebrew supplies and that home brewing has surprisingly only been legal since 1979. All that aside, the selection isn't great, but they had some good beers. Notably some Westmalles and Rochefort 10. They carried a nice selection of Troegs and, of course, Old Dominion, as well as some Rogue and a number of other varieties. I'd make the trip just to check out the pedestrian mall in Winchester, but go during the day as most of the stores close by 5. This is pretty much the only place in Winchester to get good craft beer, so make your way down to the Old Town Mall at some point to grab a sixer or two, get a few burgers and a milkshake at Snow White Grill or a coffee at Daily Grind. Theres plenty of other stuff to do, so check out the website (http://www.ci.winchester.va.us/otdb/). Murphy is in a small space on the north side of the walking mall, so plan on parking in a nearby lot or on an adjacent street. They have plenty of Virginia wines and do tasting with First Fridays, but the beer selection is straight in the back on a couple of shelves. You can expect to find Old Dominion, Stoudts and the like at Murphys. They have some pint glasses for sale as well. I remember picking up a bottle of Sam Adams Chocolate Bock here a year to two back as well. Overall, ok selection in a great location, but I prefer the selection and prices at The Virginia Touch in Berryville (off Route 7 in adjacent Clarke County) when I am visiting the Northern Shenandoah Valley.